Indian Pipe (Monotropa uniflora) – Activates rising above arguing, warring, resentment and grudges to see how each person, including yourself, is playing a role in a conflict that is providing lessons for your spiritual growth. From this perspective access forgiveness, personal peace, embody the lessons and step away from the drama. I AM encouragement for peaceful conflict resolution. 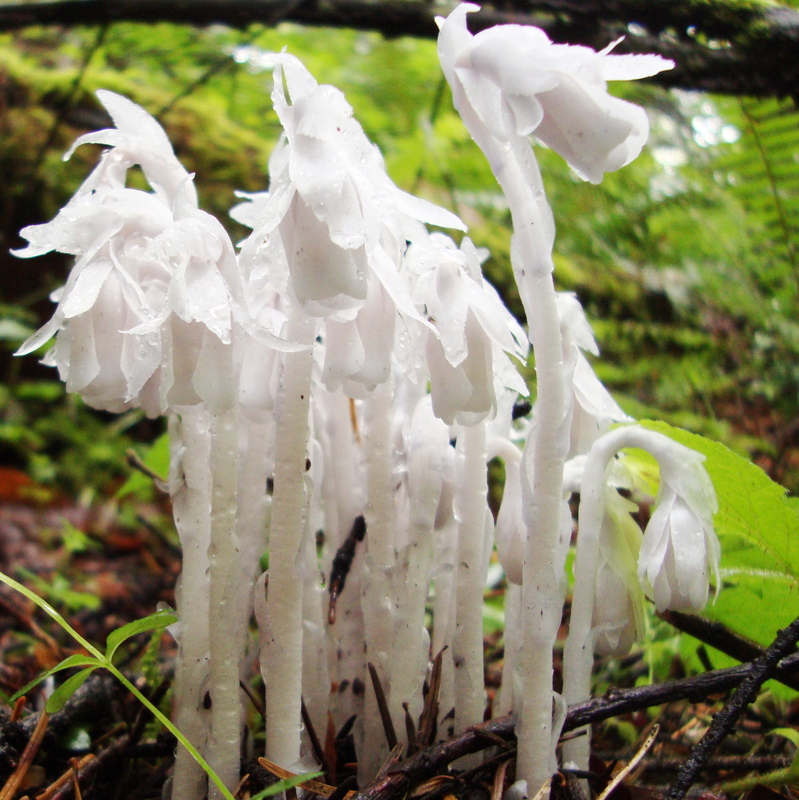 Indian Pipe is very unusual flower that is native to Pacific Northwest coastal forests. Its fleshy white stalks look like an upside down pipe. It lacks chlorophyll and so can’t make its own food. Instead Indian Pipe gains nutrition by connecting its roots with a network of underground fungi to the roots of nearby coniferous trees. Among some Native American tribes it was an indicator of where to locate wood mushrooms the next season. It was also used as poultice for wounds that would not heal. Because of its color, it is also known as ghost flower, corpse plant and ice plant. There is a Cheyenne story about the origin of the Indian Pipe plant. Chiefs were smoking the peace pipe to find resolution to a conflict between tribes, but they were holding onto grudges at the same time and could not give up the fight. The Great Spirit taught them a lesson about misusing the peace pipe by turning them into the Indian Pipe plant. The full text is given in our July 2009 Newsletter. Use Indian Pipe Flower Essence when you are holding onto grudges, bitterness and resentments. When you are caught in an argument that seems to have no resolution, or are continually “warring” with a family member, co-worker or authority figure and you are ready to end the conflict, Indian Pipe Essence will be your ally. Indian Pipe Flower Essence encourages you to rise above arguing and warring, into a higher state of consciousness. From this state of awareness you can see the roles you and the other people are playing in the conflict and the lessons that can be learned, access forgiveness, and disengage from the conflict. This process contributes to a sense of personal peace. While the essence was being made, crystals of amber, black onyx, bloodstone, chrysoprase, green tourmaline, icosahedron quartz, inca jade, smokey quartz and drusy quartz were placed among the plants with the storage (mother) bottles. The sun acts as a transformer to step down spiritual energies from higher dimensions. While the essence was being made, Amber acted as a lens to receive and focus sunlight for this purpose. Amber also aligns the subtle bodies with the physical bodies, transmutes negative energy into positive energy, and emits a sunny and soothing energy that calms and enlivens the disposition. Black Onyx helps you to absorb energies that you need from the universe, grounding them with focused energy and appropriate use of power into a positive force. Bloodstone is a stone of courage that helps you to recognize the beneficial aspects of turmoil before balance. It rebalances your base, sacral, navel and heart chakras, energy fields, and total body during the realignment of these energies. And it helps to facilitate clear thinking. Chryosprase aids you to see karmic influences in emotional patterns, heal a wide range of emotional imbalances, and release old belief systems and actions. Green Tourmaline helps you to overcome fear of change, enlivens your energy fields, and strengthens the heart. Icosahedron cut quartz has 20 (5X4) equilateral sides. It is a bridge between the 5th Dimension - the entry into the unified Spiritual realms - and the 4 cardinal directions (N, S, E, W) on Earth. Inca Jade encourages you to delight in life, this time of being Spirit in the world of matter. Smokey Quartz gently dissolves negative energies and emotional blockages and allows positive frequencies to enter. Drusy Quartz crystals help to energize and stabilize your subtle bodies. The actions of the crystals inform the way this essence seats into the physical body. As the process of making Indian Pipe essence was nearing completion, imprints of chanting, rattle and eagle feather were infused into the essence.